Why did our forefathers leave their homes and risk their lives to come to Singapore? What was life like in early Singapore? How did our forefathers evolve from being a visitor in a foreign land to becoming a citizen taking root in Singapore? 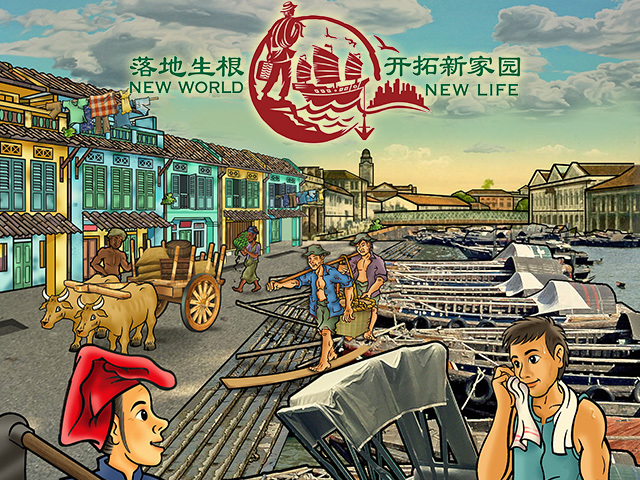 To commemorate Singapore’s 200 years of history, the Singapore Federation of Chinese Clan Associations (SFCCA) is showcasing the “New World, New Life” exhibition from 19 November 2018 – 28 April 2019 at SCCC Ho Bee Concourse, as part of its “Unsung Heroes” series of events. Travel through time at the exhibition and experience how our ancestors sailed across the seas, what were their living conditions, how they supported each other, how they nurtured the next generation through setting up schools, what kampung games they played and many more. The exhibition content spans two centuries and has many interactive elements to pip your interest in Singapore’s history and instill a greater sense of recognition for our uniquely Singaporean Chinese roots. This exhibition is supported by Lee Kuan Yew Fund for Bilingualism, Singapore Chinese Cultural Centre, Committee to Promote Chinese Language Learning and Singapore Bicentennial Office.